I was listening to this song on my drive into work today. It made me consider, all the mistakes I have ever made, in my art and in my life, have led me to who I am – a person I am becoming proud to be. I am far from perfect, but that in itself is blessing. It’s true that my paintings often become so much better as a result of a splash in the wrong place, an error made often renders a picture more beautiful, because of how I then relate to it and make it into something else. And a mistake in a piece of jewellery I’m making can lead me to a new design altogether, something that is my own, something I am happier with than I would have been, had I stuck rigidly to the pattern in front of me. And if something breaks, you could fix it. I am currently working on a final project for an art exam, which is inspired by Wabi-Sabi. 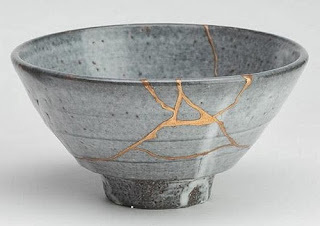 In Japan, the term “wabi-sabi” refers to an outlook that lies behind a practice of filling the cracks of a broken pot with gold. It is a practice of recognising the beauty in imperfection, in what is impermanent, and what is incomplete. Fill your cracks with gold. Be brave in your mistakes, for they all have the potential to be rendered beautiful. Rachel, thank you for the wonderful quote you shared and reminding me about wabi-wabi. I love this Japanese outlook on life. It resonates deeply with me.